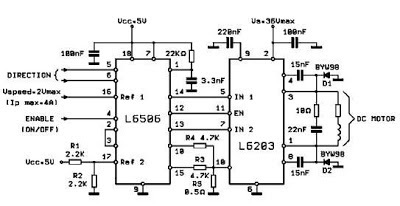 This DC motor controller circuit shown in this schematic use the L620x motor driver . The L620x is a monolithic full bridge switching motor driver realized in the new Multipower-BCD technology which allows the integration of multiple, isolated DMOS power transistors plus mixed CMOS/bipolar control circuits and is available in many versions : L6201 /1PS/2/3 . All this motor driver circuits are identically , the differences between them is the total RMS current , which is up to : 1A for L6201 , 2A for L6202 and 4A for L6203 and L6201PS . If the device is combined with a current regulator like the L6506 , can be implemented a transconductance amplifier for speed control, as shown in this circuit schematic . In this configuration only half of the L6506 is used and the other half of the device may be used to control a second motor. 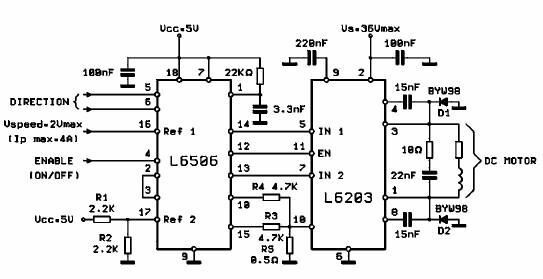 The L6506 senses the voltage across the sense resistor RS to monitor the motor current: it compares the sensed voltage both to control the speed and during the brake of the motor. A snubber network made by the series of R and C must be foreseen very near to the output pins of the I.C. VS is the maximum Supply Voltage foreseen on the application; Ip is the peak of the load current; dv/dt is the limited rise time of the output voltage (200V/ms is generally used). of the IC. Sometimes a capacitor at pin 17 of the L6506 let the application better work.